Pesto: one of my total fave sauces. You can make it with anything really. Any green, any veggie, combined with any nut, olive oil, and acid. Don’t forget the salt and heat component. Cheese is optional in my book, just make sure you have something that represents the flavor. Put all ingredients except olive oil into a food processor and blend. Stop to scrape sides of bowl. Make sure to scrape down any large chunks of spinach. Once olive oil is added and pesto is blended, adjust salt and pepper to your taste. Need help making spinach pesto? 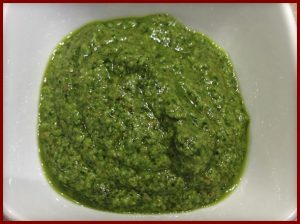 Looking for a traditional Basil Pesto Recipe? Got that, too! As always, hope you enjoy as much as I do!